Italians generally take off the month of August. 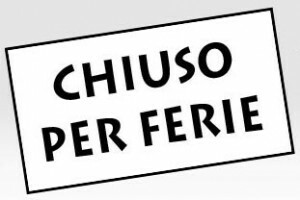 Prior to their departure to the seaside, they put up a sign that reads, "Chiuso per Ferie" ("Closed for Holiday") on their business. I, too, believe in a healthy balance between work and play. I have taken a few weeks off this blog in August before (in 2013 and 2014 at least) and feel that I need to take a blogging break again, a bit longer one at that. Starting tomorrow, I plan to take off for the next five weeks. Always optimistic and ambitious, I have wanted to embrace the longer days of summer by accomplishing so much. I'm having a tough time doing that so far. Since I am thoroughly 'work to live,' I suppose I forget that summer is by far my busiest time at work. I work quickly every minute of a shift (basically during June and July, but some years a bit before and after that) and still don't get everything I want to done. At 6 o'clock, I am exhausted. As an introvert, my energy is depleted from being the bubbly leasing professional at my apartment community for eight to nine hours. I need some time alone and to do nothing to replenish my energy. After that, I feel like myself again and can conquer the world. Sometimes I beat myself up for not leaving all my work issues behind after a half an hour's time plus a half of a glass of red wine, even after a particularly difficult work day. Alas, there are evenings when I don't accomplish much. Making and eating dinner is all I can handle. Any time of year, there is so much that I want to do during the evening such as trying a new recipe, blogging, cleaning, beauty treatments, walking, driving practice, reading, and an occasional dinner out with a friend. Only doing things on my Sunday/Monday weekends is simply not an option for a lifestyle blogger like me. I refuse. Hopefully the crazy busy season is almost over at work as prospective residents tend to move before school starts which is like the third week of August. Hopefully my workload will soon become less swamped and more steady. Plus, I have a few vacation days scheduled during September and another few in October. I decided on a blogging break for many reasons. With one less commitment, I would have more free time to make my summer great, my August amazing. To do quintessentially summery things. You know that I wished to spend the summer trying new recipes and that is still on the itinerary. I really hope to jump into that since I'm now earning much more commission and could purchase different ingredients. I also want to eat a pit beef sandwich. Like a good Italian, I want to sample gelato. I would love to patronize the wine shop I love. I have yet to sunbathe and read on a beach or at least poolside and wish to just once. I want to visit a friend and have another friend visit me. I wish to entertain al fresco on my balcony. I plan to visit that French pastry shop in Baltimore (which is closed on Sundays) with Elizabeth, the friend I visited Paris with. I want to shop for my fall capsule wardrobe. I signed up for a LivingSocial deal on a Match.com membership awhile ago. The promotional value expires on August 31, 2015. I figure I will resubscribe for a month, starting sometime in August. I'm excited to date, to be open to love and to see where that might take me. That's a lot for the last six weeks of summer, prior to Labor Day! 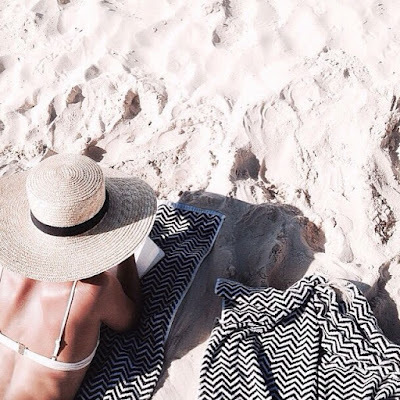 I don't want to miss out on summer; blogging is something I can do at any time, September included. Even though I feel more like myself when I blog often, expressing myself creatively as well as making sense of my thoughts and feelings, I know that it is time for a blogging break. I need to take something big off my 'to do' list. I spend a lot more time drafting a post in my head than I do actually writing it. Lazy summer days and nights will benefit my mental health too. Although I will be social at times, solitude and savoring some 'me time' is cultivating a sanctuary which will feed my soul, helping me live more consciously and reach my potential. Don't worry. I will definitely be back. Furthermore, I want to get into the habit of blogging everyday. Previously, I thought that that would mean I would publish every other or every third day. But I realize now, with the help of the book I picked back up again, Better Then Before by Gretchen Rubin, that maybe taking big steps in acquiring that habit isn't the way to go. Perhaps I need to start off with much smaller steps. I will be taking off from the blog completely for a few weeks during my break, but for the last week or two, I will get into the habit of writing a little bit each and every day, even if it's just a single sentence! As you know if you follow this blog, I want to move to a city. I do apply for jobs every once in awhile. I am emotionally ready to relocate and revolutionize my life, but I am not ready to do so financially. I am usually poor, but money does come in during the second half of the summer. I am striving to only spend a bit of my earnings, saving the majority for my next dream. At my core, I am actually a spender, not a saver. I am trying to be patient with how slowly I am progressing towards my goal as well as embracing frugality, but at times, it's hard. Like I said, I am reading that book on habits again, desperately trying to make my life change with what I have control of at the moment. Already, I'm developing a few good habits, such as waking up around 6 every day, so I can seize the day, get things done, and lead a chic life. My point of this tangent is that I don't want to go through the season only accomplishing a couple of the many items that I had in mind especially when my life isn't going my way, plus a few distractions during a tough time wouldn't hurt. Some more (frugal) fun would be welcome. I deserve perfect evenings and weekends... to dress well, go out, eat good food, truly connect with people, laugh until my face hurts and let spontaneity take over. It's been too long since I've done that. I plan to return after five full weeks with a Simple Pleasure Sunday post on Sunday, August 30, 2015. I hope to return both refreshed and bursting with summer memories. With better habits in place, I look forward to the fall with better posts that occur simply more than once a week every week. I love and appreciate my readers and hope that you'll stick with me. I need this. I promise to make the most of my time away and come back rejuvenated. Have a joyful rest of July and an awesome August! Good for you! You know what you need...you are replenishing yourself and what better time than August! Sometimes bloggers continuously post one picture (a lame grasp to reconnect) day after day... your authentic voice wants you for you to post what you want when you are ready.... not just grist for the mill....... please rest and continue when you are ready! The audience is there. You should read Janice MacLoud's book, Paris Letters (or again, if you already have), then pick up a used copy of The Artist's Way, by Julia Cameron. Janice shows you what an artist's life can look like, and Julia's book tells you how to accomplish that. Janice used The Artist's Way to radically transform her life. It sounds like that's what you want to do. Buy them. They work. And Janice's book tells you how to save a ton of money. She saved so much in just a couple years that she quit her job and moved to Paris and made all her dreams as a writer and artist come true. If that doesn't sound delicious, then what does?? Go order used copies on Amazon!